When you want to fully customize the labels of your chart, you can use Label Strategy to override the labels' appearance, content and layout. In order to use Label Strategy you have to greate a class inheriting the ChartSeriesLabelStrategy class and specify the LabelStrategyOptions you wish to customize, and override their corresponding methods. DefaultVisual: The strategy will provide a custom visual element for each label. You have to override the CreateDefaultVisual method. Measure: The strategy will provide custom measurement logic for each label. You have to override the GetLabelDesiredSize method. Content: The strategy will provide custom content for each label. You have to override the GetLabelContent method. You can also override the SetLabelContent method used for UI virtualization and allows to reuse label content when panning and zooming. Arrange: The strategy will provide custom arrange logic for each label. You have to override the GetLabelLayoutSlot method. 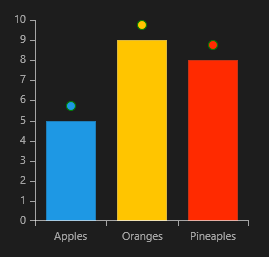 You can use the Bar Series article to see how to create a chart with bar series. If you use elements that do not have desired size you have to override the GetLabelDesiredSize method.